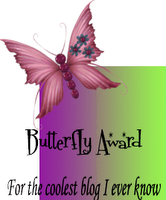 Pinay WAHM: Cool Blog Award....a Tag! Michelle passed this tag on to me. It's a butterfly! Yipee...LOL. The little one here likes butterfly a lot so it's big hit for her to say the least. Thanks much for this Michelle. i got a tag for you mommy J.
Wow ka cute naman ng butterfly. I missed having an award from friends though. I got so many alerts telling me that i have an award from them but wasn't able to claim those awards. Anyway, i will get them now soon as i get the chance. Good morning Mommy J! i awarded this to u too, sis. wasn't aware nabigyan ka na pala ni Mitch. hehe. musta sis? tagal ko atang di napadalaw here. hope all is well.